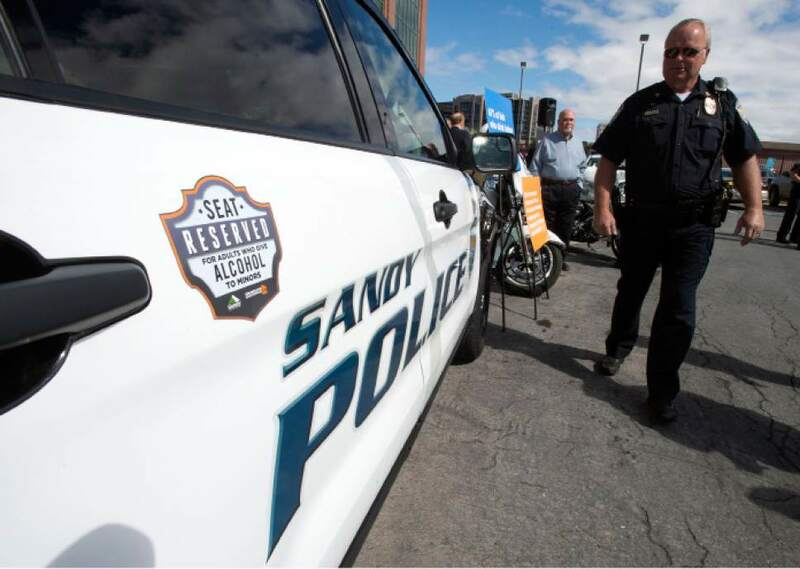 Sandy City Police cars will be sporting a new slogan — "Seat reserved for adults who give alcohol to minors" — as part of a new campaign to alert parents to their role in preventing underage drinking. Studies show that the majority of kids who drink obtain their alcohol from home. "Forty-five percent of kids who drink before age 13 become alcohol-dependent, and parents often talk to their kids two years too late concerning alcohol," said Sandy Mayor Tom Dolan in a news release. The graphics were unveiled Monday and will remain on the cars for six months — the first stage in an awareness-raising effort that's a partnership between Sandy City Police Department, the mayor's office and ParentsEmpowered.org. Plans for Phase 2 of the campaign, according to the news release, include community meetings to discuss underage drinking. We didn't think we were going to get this many (arrests). We were going to end several weeks earlier. Then we found more kids willing to sell to us and we continued with the operation. OGDEN — Thirteen students from three high schools in Weber County were arrested Tuesday, culminating a months-long investigation by the Weber-Morgan Narcotics Strike Force. Eleven of the arrests were at Bonneville High School. Based on information from the school resource officer, an investigation into possible drug dealing at the school was started by the Weber-Morgan Narcotics Strike Force several months ago. "We didn't think we were going to get this many (arrests). We were going to end several weeks earlier. Then we found more kids willing to sell to us and we continued with the operation. We thought we would get a half-dozen," said strike force Lt. Darin Parke. "Hopefully, it will send a message they better start making different choices in life." The students were pulled out of class one at a time on Tuesday morning and arrested. Eleven boys and two girls were arrested. Eight of those arrested are 17 years old and the other four were 16. One of the arrests was at Roy High School and another at Two Rivers High School. All of the students were expected to be charged with felony drug possession with intent to distribute before being released to their parents, Parke said. The drugs being dealt were marijuana, Ecstasy, prescription medications and psychedelic mushrooms, he said. The investigation into who was supplying the students was continuing. "We've identified a couple of source dealers," Parke said. All of the drug deals originated at the school. The two parties would then arrange to meet later to complete the deal. Some deals were completed off school property while others were made in the school itself or the parking lot, Parke said. Although the 13 arrested were aware of each other, they were not working in conjunction with each other, he said. Their levels of involvement varied. "It ranged from them telling us they can get anything they want, to some not very experienced at it," he said. Tuesday morning, drug sniffing police K9s were brought into Bonneville High School to check several lockers but no drugs were found. Weber School District spokesman Nate Taggart said the district worked with law enforcers for this operation. "We agreed with the narcotics strike force to have an operation in our school. We do that on a regular basis at all of our high schools," Taggart said. "We want to protect our students and see that the kids who need help get it." Those who were arrested have been suspended from their schools and will have hearings to determine alternative placement. Although police admitted they were a bit surprised at the number of students who ended up being arrested, both police and school officials stressed drugs are not a problem just at Bonneville High School. "We know that there are issues that are taking place in our schools that reflect society. We're hoping that by getting these kids out of the school, hopefully it's going to change their lives and make it safer for our schools," Taggart said. "This is a problem nationwide and statewide, not a Bonneville High problem. We don't want to paint a picture that this is the only place that has a situation like this," said Weber County Sheriff's Lt. Mark Lowther. Parke said similar operations had been conducted in the past at other schools in Weber County.